This springtime, the Giant Fennel may be abundantly seen throughout the Maltese countryside. It is found in different areas, varying from garrigue habitats, abandoned fields, disturbed grounds, countryside lanes and more. Everywhere you look at Dingli Cliffs, one can find the umbrella-shaped flowers of this plant. The yellow flowers appear from end of February to June, from stalks growing to heights of 2.5m. The plant species is different when compared to the European Ferule or the African Ferule. 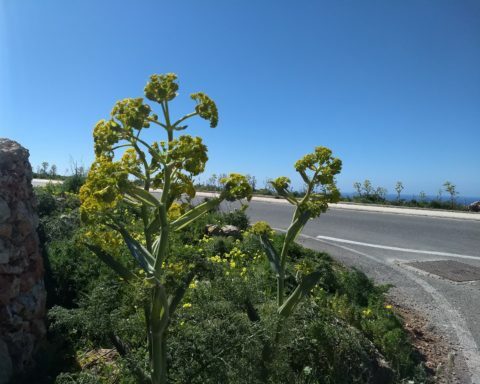 Whilst the Maltese plant has links to the Tunisian one, just end of December 2018, it was identified that the Maltese plant of the “Ferla” is endemic to the Maltese Islands, and given a new scientific name – Ferula melitensis. The Maltese plant is more robust that the Common Fennel (Ferula communis) because it had to adapt to the Islands’ conditions, and the isolation from North Africa. Other Maltese endemic plants tied to North Africa include the Maltese Salt Tree (Darniella melitensis) and the Maltese Fleabane (Chiliadenus bocconei). The Fennel’s purposes were also used as firewood and dried stalks were used to sharpen razor blades. In the past, this species was used for medicinal purposes for the treatment of skin infection, and dysentery. Inadequate doses were found to be poisonous. This plant is easily distinguished from the Common Fennel (Foeniculum vulgare) because the Giant Fennel has a thicker stem, darker foliage, larger and denser inflorescences, larger seeds and lack of aromas. To learn more about the surrounding countryside and the seasonal biodiversity, join us in one of our eco-walks. Find more about the eco-walks on http://www.thecliffs.com.mt/tour-information/ or contact us on 79642380.